The Capital Campaign Toolkit provides you with everything you need for a successful campaign. Inside, you’ll find all the tools, templates, resources and support you need at every stage of your capital campaign. The Capital Campaign Toolkit is a comprehensive, online system for planning and leading a successful capital campaign. You’ll find templates, worksheets, step-by-step guides, planning resources, and other tools that walk you through your campaign, from start to finish. This system provides a clear roadmap and tools, along with easy-to-access support by campaign experts. It’s got everything you need to succeed. Platforms like LegalZoom, WebMD, and TurboTax make it possible for people to get the professional information and expertise they need easily and affordably. And now the Capital Campaign Toolkit provides you with the high-quality information and expertise you need to conduct a capital campaign. While some organizations use the toolkit without additional support, we recommend combining the toolkit with expert campaign coaching and support, unless staff members have extensive campaign experience. We offer two levels of support – individualized and group. You can choose the level of support you need at every stage of your campaign. The Capital Campaign Toolkit puts you in the driver’s seat, giving you everything you need to ensure your campaign’s success. Want to take a sneak peek inside the Toolkit? Watch our 5-minute video demo, or click here to request a live demo. We’d be happy to talk to you and answer any questions you may have about your campaign. 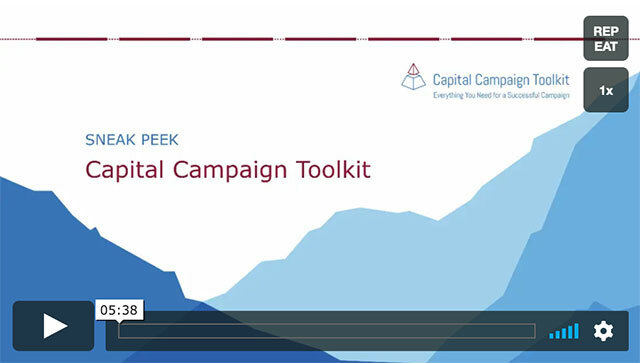 Discover how the Capital Campaign Toolkit can work for your capital campaign.